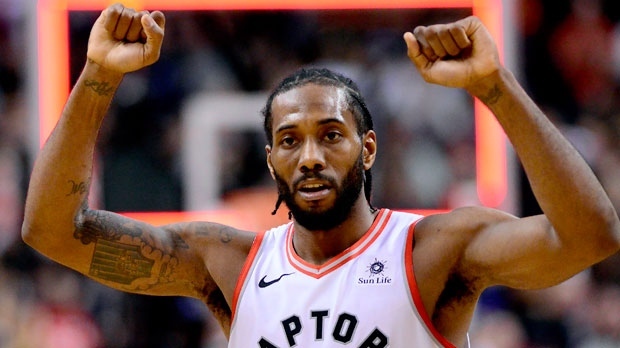 TORONTO -- Raptors forward Kawhi Leonard was named the NBA's Eastern Conference player of the week on Monday, the sixth time he's earned the honour and second time this season with Toronto. Leonard led the Raptors in scoring last week, averaging 30.7 points, 8.7 rebounds and shooting .538 from the field. He also shot .471 from three-point range and .824 at the free throw line as Toronto went 3-0. The highlight of Leonard's week was a 41-point performance during Toronto's 140-138 double-overtime victory Jan. 13 at Washington. It was his second 40-point contest this season and extended a career-high streak of consecutive games with 20+ points to 19 games. Leonard recorded two double-doubles last week -- Jan. 13 at Washington (41 points, 11 rebounds) and Jan. 11 against Brooklyn (20 points, 11 rebounds) -- increasing his total to 11 double-doubles for the season. During the Raptors' 104-101 win Jan. 8 over Atlanta, Leonard recorded a season-high six steals to go along with 31 points and six assists. Highlights from Super Bowl LIII in Atlanta. Images from the Raptors' home opener.